Last night wasn't very exciting ... I did make it to Yoga tho. It was helluva difficult after having missed it all of last week. That and I had hurt my knee yesterday in a freak accident of smacking it full on while opening a door ... I was in much pain. Anyway, other than that I started a new series, the last of the lot I got from Varen, The Lost Room. Only watched the first episode and although I started out confused it is starting to make more sense. I'm also proud of myself after yesterday. I spent the week at the leadership course learning all about ways of improving myself when interacting with others. And yesterday, being the first day back at work, I took up the challenge (and it was) and really concentrated on tempering my gut-reactions (luckily nothing too frustrating happened!). I'm not sure how long I can maintain this demeanor in the face of abject annoyance but, for the mean time I am trying ... and that itself is a step in the right direction. So, off on another tangent, I have some books to review. First, I finished Mark Billingham's Lazybones. Someone - a woman or somebody pretending to be a woman, is writing to convicted rapists in prison, befriending them and then brutally killing them when they are released. DI Tom Thorne must discover the link between these killings and a murder/suicide that took place twenty-five years before; a tragedy to which the only witnesses were two small children, now adults and nowhere to be found...How can you escape a past that will do a lot more than just catch up with you? And how can Thorne catch a killer, when he doesn't really care about the victims? This was a good read with a nice twist ending ... even tho you knew the twist was coming and I was concentrating pretty hard to figure out whodunnit, I didn't get it right. 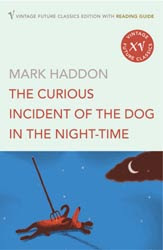 Then, I finished Mark Haddon's The Curious Incident of the Dog in the Night-Time. I enjoyed it. Not quite as much as Extremely Loud tho. I like the way both these authors have managed to capture the honest and directness of a child-like mind. Before all the pre-conceived notions of adulthood step in. And that is as exciting as life gets ... which is apparently not very. I guess I'm in that phase of "going thru the motions". Which I know does end eventually. It's just hard to see a way out right now. But it will come, it must. This is, after all, life. What do you mean ?? I have a Book Review Blog ... and a Restaurant Review Blog and a Movie Review Blog and an Accommodation Review Blog - it's just that sometimes my life gets in the way of all these great reviews! have you read Haddon's A Spot of Bother? @saaleha - nope, haven't read that ... looking it up on kalahari now! I'm always up for a good recommendation :) I think people are far more likely to read books based on that than random finds ... although both can be effective!